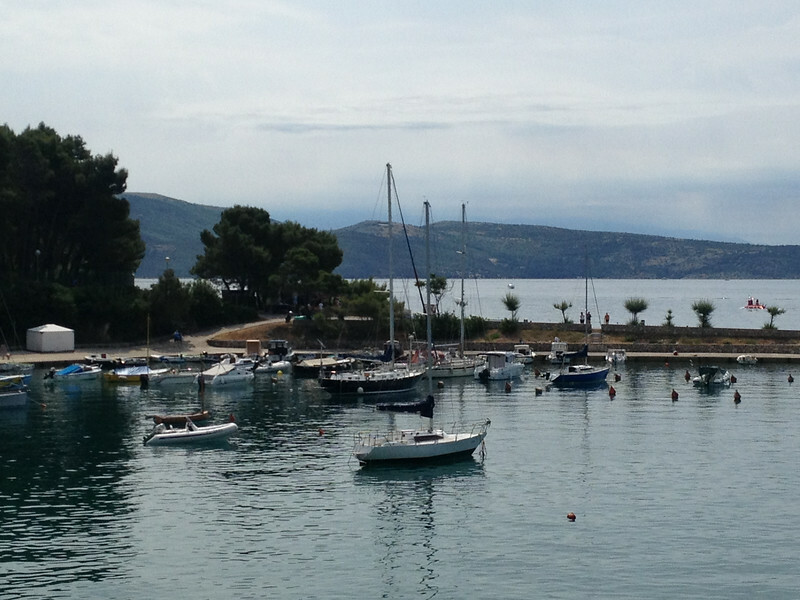 We just couldn’t leave Croatia without visiting one of the islands. We didn’t want to drive too far south since we had plans to meet a friend in Belgrade, Serbia in a few days time so we chose the largest of Croatia’s islands, Krk. After paying the 35 kuna (4.50 euros) toll to cross the bridge that links Krk Island to the mainland, we stopped at the first lay-by to look at the Adriatic Sea. If you have not booked accommodation yet, you may find a good last minute deal here as you will be approached by people renting holiday apartments or advertising one of the campgrounds. We ran into a charming young man named Elvis who, after checking our license plate, started a conversation with us about how he was saving money to move to Dublin. Yes, I’m sure the city changes based on the license plate of who he is talking to but he was very nice. He told us about a campsite that we could see just across the bay and offered us a good discount on the normal rates. We agreed to at least check out the campsite and he gave us a leaflet for a sushi restaurant near the campsite. Unfortunately, the campsite he directed us to was almost full with what looked to be people staying longer term and I couldn’t see a single shady spot to pitch our tent so we continued down the road. 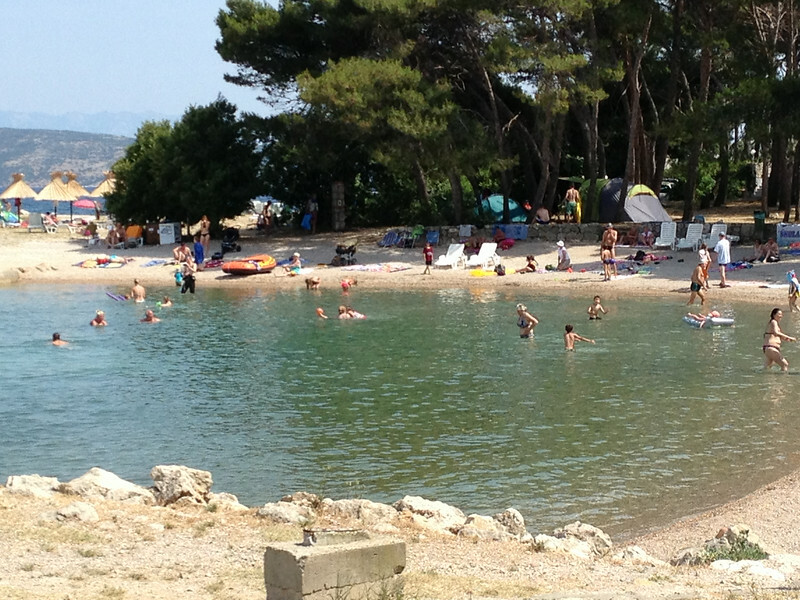 We chose Camping Ježevac, located right next to the marina in Krk town. 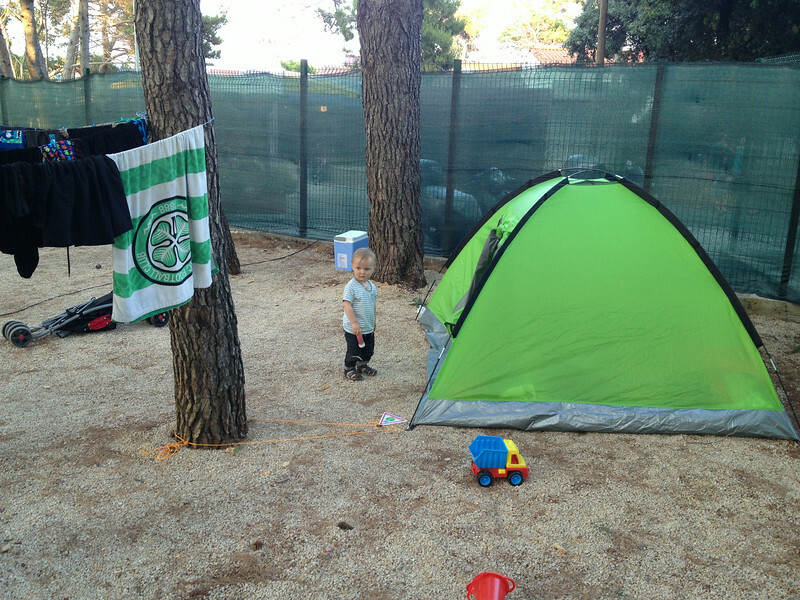 At 23 euros a night for a tent pitch without electricity, it wasn’t the cheapest on the island but the tent pitch area was well shaded by pine trees and it was right next to the water and a short walk into Krk town. Settling in to the new campsite. 1. The tent pitch area is well leveled but the ground underneath the gravel is extremely rocky and I found it impossible to drive the tent pegs in on two sides and ended up securing one side to the fence and another to a tree. If you have more technical pegs than the standard ones that come with cheap tents, this may not be an issue for you. 2. The area is shaded by pine trees and we got some pine resin on our tent and clothing line. It is sticky and difficult to remove completely if you get it on you. I was able to get it off my hands with almond oil. 3. There is no swimming pool and the children’s playground is tiny and not that much fun for toddlers. There was supposed to be a sandbox area (the beach is pebbles not sand) but we never found it. 4. Don’t pitch your tent right next to the fence like we did. There is a restaurant and bar on the other side and the noise continues after midnight. Swimming area at Camping Ježevac. The temperature outside was boiling but the Adriatic felt cold to me. Keep in mind, my only experiences of swimming in the sea are in Texas and Thailand so I’m used to warmer water. Micheal enjoyed it more than I did, but then I also have a ridiculous shark phobia that makes me jump at every shadow in the water. 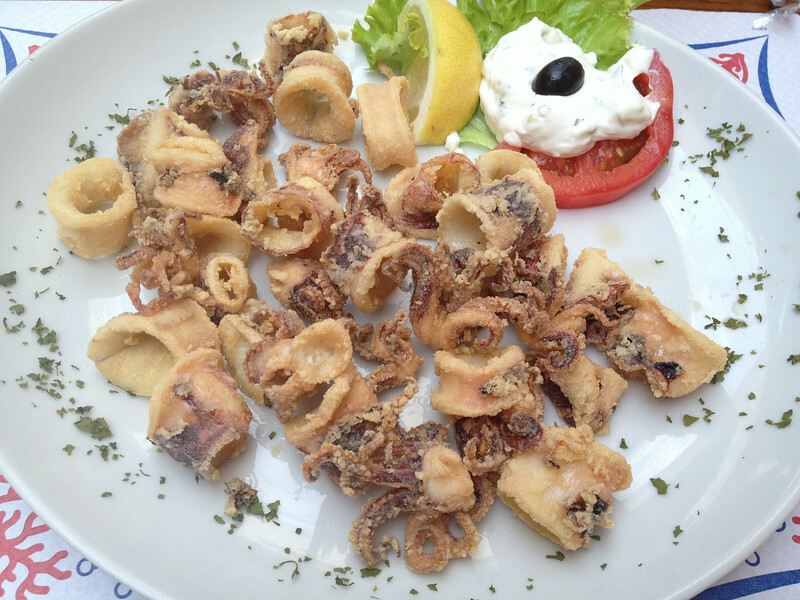 Fried calamari from the campground restaurant. The campground has a small grocery shop, a restaurant, a beach shack style bar and a waffle stand. Many more restaurants can be found on the other side of the marina. If you are on a tight budget, there are two kebab shops in Krk Old Town. If you need toiletries or baby items, there is a DM Drogerie (drugstore) on Stjepana Radica street. If you didn’t get a camping pitch with electricity, the only cafe we found with an accessible power outlet was Caffe Bar Caffettaria on Vela placa. Cobblestone street in Krk Old Town. Krk Old Town is small and can be explored in an afternoon. There is a 11th century cathedral and a castle built between the 12th and 15th centuries. 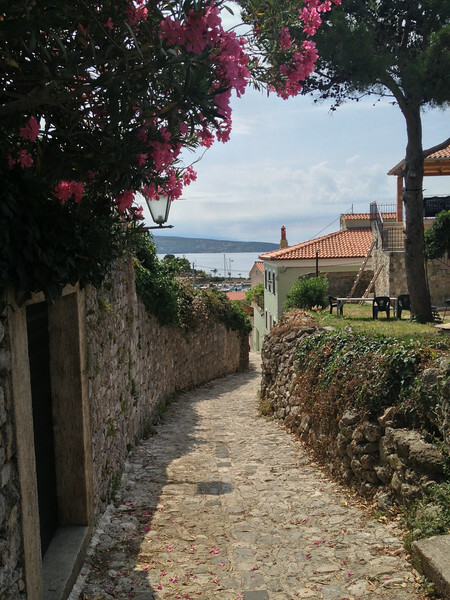 After you have explored the town itself, you might want to take a boat tour to one of the neighboring islands: Cres, Rab and Losinj. Krk Island lacks the party atmosphere of some of the other Croatian islands. While we did notice a few cocktail bars and at least one disco in Krk, many of the tourists were older German couples or families with young children. Depending on your priorities, this could be a great thing or a little boring. Overall, we enjoyed the three nights we spent on Krk. I would like to visit Croatia again and some of the islands farther south. Perhaps next summer?